The use of robots around the home to mow lawns, vacuum floors and manage other chores is set to surge sevenfold by 2007 as more consumers snap up smart machines, the United Nations said. That boom coincides with record orders for industrial robots, said the U.N.'s annual World Robotics Survey, released Wednesday. The report, issued by the U.N. Economic Commission for Europe and the International Federation of Robotics, said that 607,000 automated domestic helpers were in use at the end of 2003, two-thirds of them purchased that year. Most of them — 570,000 — were robot lawnmowers. Sales of vacuum cleaning robots reached 37,000. By the end of 2007, some 4.1 million domestic robots will likely be in use, the study said. Lawnmowers will still make up the majority, but sales of window-washing and pool-cleaning robots are also set to take off, it predicted. Sales of robot toys, like Sony's canine AIBO, also have risen. 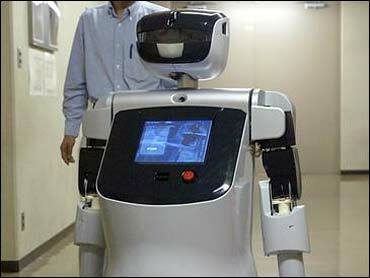 The study said there are now about 692,000 "entertainment robots" around the world. Colin Angle, Chief Executive of iRobot Corp. of Burlington, Massachusetts, said many consumers had been introduced to the idea of household robots 40 years ago with Rosie, the mechanical housekeeper for the futuristic cartoon family The Jetsons. But until now robots have failed to live up to their promise. "Our biggest hurdle right now is skepticism," Angle said. But "we are just at a point where robots are becoming affordable ... and some of them can actually do real work." UNECE said household robots could soon edge their industrial counterparts, which have dominated the figures since the U.N. body first began counting in 1990. Industrial robots have nonetheless continued to recover from the slump recorded in the 2001 study. "Falling or stable robot prices, increasing labor costs and continuously improving technology are major driving forces which speak for continued massive robot investment in industry," said Jan Karlsson, author of the 414-page study. In the first half of 2004, business orders for robots were up 18 percent on the same period a year earlier, mostly in Asia and North America. Japan still remains the most robotized economy, home to around half the current 800,000 industrial robots. After several years in the doldrums, demand there jumped 25 percent in 2003. But Europe and North America are fast catching up, the study said. European Union countries were in second place, with 250,000 robots in operation by the end of last year, mostly in Germany, Italy and France. Demand from North American businesses rose 28 percent, with some 112,000 robots in service by the end of last year. The machines are also taking off in richer developing countries, including Brazil, China and Mexico, spurred by plummeting prices. Taking the global average, a robot sold in 2003 cost a quarter of what a robot with the same performance cost in 1990, the study found. It said that by 2007, world industrial robot numbers will likely reach at least 1 million. The term "robot" covers any machine that operates automatically to perform tasks in a human-like way, often replacing the human workers who did the job previously. In most cases, robots move under their own propulsion and do not need to be controlled by a human operator after they have been programmed. Most industrial robots are used on assembly lines, chiefly in the auto industry. But increasingly, companies are using them for other tasks, the study said. There are now some 21,000 "service robots" in use, carrying out tasks such as milking cows, handling toxic waste and even assisting in operating theaters. The number is set to reach a total of 75,000 by 2007, the study said. By the end of the decade, the study said, robots will "not only clean our floors, mow our lawns and guard our homes but also assist old and handicapped people with sophisticated interactive equipment, carry out surgery, inspect pipes and sites that are hazardous to people, fight fire and bombs."